I have been switching up pictures and paintings in our living room ever since we moved into our house. I try something out for a few weeks then hate it and move it around. The problem I have is I have 3 walls in a box that are bare but when I put stuff on them they look cluttered. So I have been humming and haaaing about which wall to put things on. Unfortuntately I don't have great photos of this zone but I'll do my best to describe it. 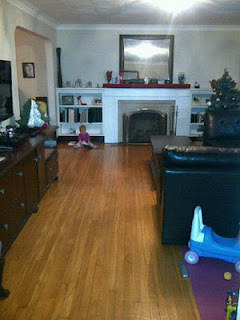 Below is my living room (from Christmas because apparently thats the last time I took a photo... I MAY need to update my archives a little!!!) The 3 walls I'm talking about are the wall on the left of the picture where the tv is hung. There is about a 5 to 6 foot section where there is nothing on the floor and nothing on the wall.... aka big bare spot that junk gets thrown. Then to the right of the photo is Norah's play area and we have the wall on the right and the wall next to the doorway. 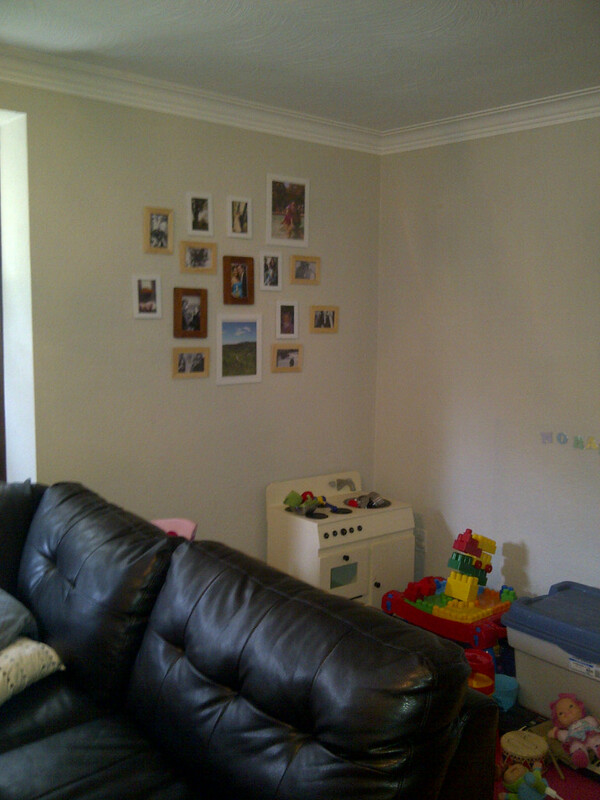 These are the walls in Norah's play area. This is where we made Norah's magnetic board way back when here. As you can see I had hung 5 small pictures on the one wall. But after it sitting like that forever it looked pathetic with 5 tiny photos in a big bare space. 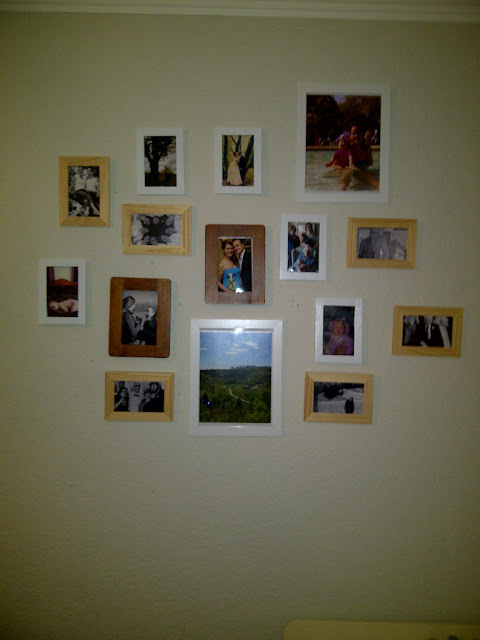 After a lot of thought I decided I wanted to create a photo wall with different frames and sizes. Originally I planned on panting all of the frames white but after hanging the frames on the wall I decided I like the mismatched frames! I pulled out a bunch of frames I had lying around and organized them in a pattern on the floor. Once I was happy with that I cut out paper in the same size as the frames and taped them to the wall in the same pattern. I didn't want to mess up and make a million holes in the wall!! Then I just put a nail in the paper that was hanging to get everything at the right height and that was it! Here is how it looks now! After looking at it for a few days I have decided I need to move the top middle frame up a few inches... its a little too level with the frame on the left but I'll get to that eventually. And here you can see the entire corner. The blankness of the other wall doesn't bug me because that is the magnetic wall and once Norah stops eating everything in sight her magnets will be hung from that wall. Now the next task is to find or make something to hang on the wall across from Norah's play area... But in the meantime we are happy with this.